Best Pricing on the Internet! Single Pair Ear Candle Pricing Now Available!!!! Many professionals think so! 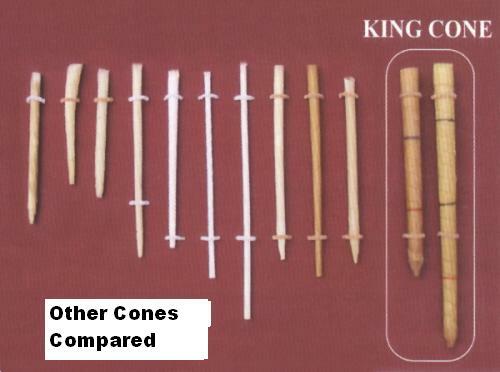 After using King Cone Ear Candles, many will use no other.The size of our cones are much larger than anything else on the market. Designed by an Aerospace Engineer/Massage Therapist, modern technology and ancient healing wisdom were brought together to develop the highest quality Ear Candle possible. Our Ear Candles are made with 100% natural cotton, beeswax, palm kernel and oil (No Parrifin). All of our Cones are 1″ in diameter. Our tip is a funnel like taper to just under a 1/4th of an inch. For your comfort, the tip of the ear cone is double dipped in bee’s wax. This provides a soft gentle feeling when held to your ear canal, providing a better fit and seal for the vacuum process. This ancient Modality has its roots in many cultures worldwide and most communities today have some of it they use. It is used to facilitate healing around ear pain, ear fullness, ear discomfort and many forms of Dis-ease associate with the Ears. This not a medical treatment and no claims are being made here. This is an energy clearing treatment that has been known by some to reduces symptoms in the area of the Ears, Head, Eyes, Sinus and Neck. The business: This ancient healing art known and Ear Coning and Ear Candling can be incorporated with, and compliments most Holistic Healing practices: Massage, Chiropractic, Colon Hydrotherapy, Chinese Medicine, Energy Work of any kind, the list is really endless. Many holistic therapists use this modality as part of their personal cleansing to increase their effectiveness as a channel of healing. 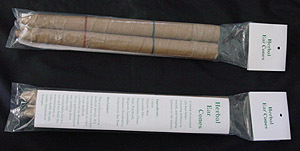 With recent publicity, there has been a vast increase in popularity and demand for Ear Candling. It is now offered in many Day Spa’s and Resorts. Ear Candling is a simple and effective modality. Many consumers purchase Ear Candles for personal use on themselves, friends and family members. *Disclaimer: This is not considered to be used as medical treatment, and no claim is being made for any such cure. Those participating in ear candling must assume full responsibility for its use, and not hold the manufacturer, or seller liable for any claims, expenses, or damages. *Warning: Do not engage into practicing ear candling alone. Ear candling should be done with at least two people. Be sure to have a well ventilated area.